Much of James chapter 3 is devoted to the taming of the tongue – how one should be careful of the things that we say because the mouth is meant to praise God, to honor others, and we dishonor ourselves by using our mouths to curse; and we dishonor God by using the mouth that had just been cursing to praise him. In essence, a taming of the tongue goes a long way to making peace with others as well, and this is what James goes on to talk about when he speaks of the wisdom that comes from heaven and not the wisdom that is earthly. Peacemaking is wise, and righteous. In today’s study, we will examine what exactly did James mean by the term ‘peacemakers’ and how these people can reap in a harvest of righteousness. Peacemakers – Who are peacemakers? The word itself is literal enough – people who make peace. People who love peace [James 3:17], people who advocate and stand for peace, people who desire peace, cultivate peace, expect peace, practise making peace. Not people who start wars. Not people who are eager for conflict. Not people who sow discord. who sow in peace – Surely one wouldn’t be called a peacemaker if he or she does not sow in peace. James describes peace-loving as a trait of one who possesses the wisdom that is heavenly – and in general a peace-loving person would make peace, would be peaceable. And the peace that they pursue should not be regarded as the worldly peace, but the peace of God, which, after exercise and maintaining, is a seed that is sown by them intentionally. The peace of God transcends all understanding [Phil 4:7|Article], and it is this peace that peacemakers will pursue, even if they may not live up to such a high standard all the time. 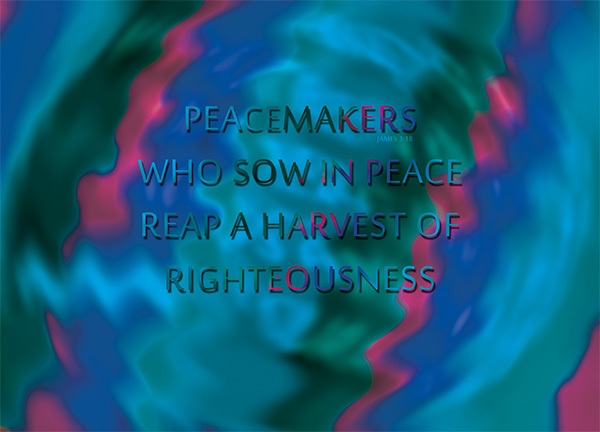 But in making peace, in sowing the seed of peace, they will reap in a great harvest – a harvest of the fruit of righteousness, which is something they shall enjoy. Hosea 10:12 – Sow righteousness for yourselves, reap the fruit of unfailing love, and break up your unplowed ground; for it is time to seek the LORD, until he comes and showers his righteousness on you. Isaiah 32:17 – The fruit of that righteousness will be peace; its effect will be quietness and confidence forever. Hosea 10:12 tells us that sowing the seed of righteousness will bring forth the fruit of unfailing love; Isaiah 32:17 says the fruit of righteousness is peace – quietness and confidence forever. It is almost like a cycle – sowing in peace breeds a harvest of righteousness, sowing in righteousness breeds a harvest of peace too, amongst other things. This fruit of righteousness enables us to live righteously, godly, soberly in the grace of God. With a peace of conscience, we will walk in God’s path and be right with Him. Are you a peacemaker? Or are you an escapist? There is a difference, isn’t there? Loving peace doesn’t give us an excuse to avoid our problems or the issues that must be addressed. Loving peace just means you deal with the problems and issues in God’s peace, in God’s ways, in righteousness. Loving peace is not enough – we are asked to make peace. Create peace. Bring about peace in a chaotic place. When there is the peace of God, many other things will follow.